at Lakeshore Road, Whitchurch-Stouffville. Copperstone Ballantrae has a total of 18 units. 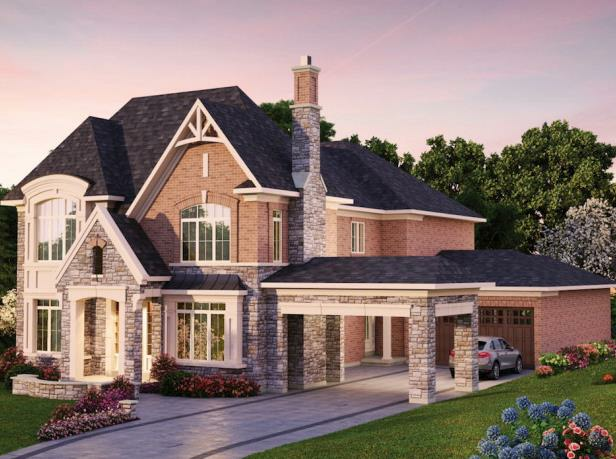 An intimate enclave of just 18 Manor Homes in Ballantrae. Architecturally controlled community designed homes with genuine clay brick, structural precast stone, “maintenance free”* Hardie Board siding and trim, decorative moldings and accent features. ** House siting and exterior colour packages will be architecturally controlled. Architectural features including raked and/or tooled masonry joints (Vendor’s choice), detailed dormers, metal roofs, decorative brackets, decorative columns, finials, shutters, turrets, box bay windows and copulas, as per elevation. Corner lot elevations to receive enhanced details, as per Architectural Control. Engineered roof systems with raised heel trusses. Prefinished “maintenance free”* aluminum soffits, fascia, frieze, eavestroughs and downspouts, as per elevation. Premium manufacturers “shake like” profile architectural shingles provide durability, high grade and tear resistant. Copper and/or metal roofs, as per elevation. Wood and steel beam construction. Engineered floor joist system for all subfloors, not including landings. Poured concrete basement walls with heavy duty damp proofing, weeping tiles and exterior drainage membrane. Poured concrete porches on main and secondary entrances on the front elevation. ** Precast patterned patio slabs to front door, layout of steps determined by Vendor. ** Rear and side door(s), where applicable, to receive precast concrete step(s) where grading does not exceed 3 risers. Entry-resistant framing on all perimeter doors (excluding patio doors). Concrete garage floor with reinforced grade beams. Rough-in BBQ gas line to rear of home (appliance not included), location determined by Vendor. Garage interior to be finished with drywall, one coat of tape and primed. “Power Pipe” (or equivalent) to be installed in each home (except for model CSBUN-03 non loft) for heat recovery from waste drain water. PEX (cross-linked polyethylene) hot and cold water lines throughout. All homes to be “Grey Water Ready”. “Maintenance free”* thermopane Energy Star® qualified coloured vinyl casement windows on all front, side and rear elevations. Coloured window frames as per the exterior colour packages approved by the Controlling Architect. Muntin bars within the panes of glass, on front elevation only. ** Standard basement windows to be Energy Star® qualified white vinyl sliders. All windows, including basement windows, to be double-glazed with low emissive coating, argon filled gas with insulated edge spacer bars for greater energy cost savings. All operable windows to have screens. Some decorative windows are fixed glass. All exterior doors, windows and building perforations to be foam insulated and fully caulked. Thermopane exterior metal Garden or French door(s) (no screen). ** Muntin bars and screens not included. Extra large basement windows, 24? high. *** Window wells to be installed to accommodate standard basement window(s) depending on grade, at Vendor’s discretion. Purchaser’s choice of three (3) upgraded, smooth finish, decorative-panel interior passage & closet doors throughout, from Vendor’s standard samples. Vendor’s choice of pewter finish or brushed satin nickel finish levers and hinges (hinges not painted) throughout. Pot lights – ten (10) on main floor, not including vaulted/raised/cathedral areas. All pot lights are energy efficient with compact fluorescent or low voltage bulbs, Vendor’s choice per Vendor’s standard samples. Maximum of two (2) additional switches. Locations selected by Purchaser(s) and approved by Vendor. 200 AMP service with circuit breakers and copper wiring throughout. Heavy-duty cable and outlet for oven and dryer, plus 110 volt outlet for gas stove only. Electrical outlet for the washing machine in the laundry room. GFI protected electrical outlets in garage: one (1) per car park on the wall and two (2) or three (3) outlets in garage ceiling for future installation of garage door opener(s) at Vendor’s discretion. Garage door opener(s) not supplied. All electrical plugs and ceiling light fixtures located within all exterior walls and insulated ceilings are installed in sealed boxes. Ceiling fixtures in foyer, hallways, laundry room, morning room, kitchen, servery, mudroom, walk-in pantry, craft room, media room, dressing area, sitting room and all bedrooms to have Energy Star® compliant compact fluorescent light bulbs (min. 75% of home). Vendor supplied fixtures. All electrical switches and outlets to be white Décora. Electronic smoke detectors on all levels of the home and carbon monoxide detectors on all levels that have bedrooms. All bedroom plugs to be protected with arc fault breaker(s). Rough-in central vacuum outlets centrally located on each finished level in finished areas. Pipes dropped to unfinished space in basement only. Dedicated electrical outlet for refrigerator and dishwasher. Electrical outlet provided below counter within kitchen island and/or peninsula cabinet, as per code (only applicable on the island when the island is permanently fixed with plumbing). Upgraded R31 expandable spray foam insulation to garage ceiling and exterior overhangs where there are livable areas above. Exterior walls above grade insulated to R24, achieved with an exterior thermo break for superior performance. R50 blown insulation in all attic space above living areas. Basement walls full height with R20 blanket insulation to approximately 6? above the basement slab. High-efficiency, Energy Star® qualified, 95% efficient, 2 stage ECM gas fired forced air gas furnace(s) with ductwork sized for future central air conditioning. Location and orientation may vary at Vendor’s discretion without notice. High efficiency condensing gas fired hot water heater on a rental basis with designated supplier at Vendor’s sole discretion. All homes to be equipped with an Energy Star qualified HRV (Heat Recovery Ventilator) paired with the furnace. Only one HRV supplied for each home. Electronic programmable thermostat(s), centrally located on the main floor. Location of thermostat(s) at Vendor’s discretion. All supply metal duct work joints throughout the home are sealed for better delivery of conditioned air. Ducts professionally cleaned and sanitized. (Purchaser supplied with certificate, which is to be redeemed within 3 months from date of closing). Exterior venting for dryer in laundry room. “Oatey” box (or equivalent) recessed in the wall in the vicinity of the washer to facilitate ease of connection of washing machine hot and cold water lines as well as the drain. For second floor laundry rooms only, washer/dryer designated location,** to have tiled baseboards, a raised marble sill and a vinyl lined sloped tiled floor to the floor drain. Orientation at Vendor’s discretion. Single stainless steel basin laundry tub where shown on plan to have two (2) handle faucet and to be set in a base cabinet. Base cabinets in laundry and/or craft rooms, as per plan, to be white melamine with choice of laminate top from Vendor’s standard samples. Benches,** where applicable, to consist of a painted MDF top. Interior walls to be painted with two (2) coats of off-white premium quality latex paint, one (1) coat prime plus one (1) finish coat. Purchaser(s) choice of colour from Vendor’s standard samples (one colour throughout standard). All interior doors and trim to be painted with two (2) coats of off-white premium quality semi-gloss finish, one (1) primer plus one (1) finish. Hinges not painted. Main staircase in 2-storey and loft designs (basement to 2nd floor) to be stained oak veneer, in Purchaser’s choice of colour from Vendor’s standard samples. Main stairs to basement in bungalow designs, to be stained oak veneer, in Purchaser’s choice of colour from Vendor’s standard samples. 1¾” oak pickets, handrails and nosing*** stained in choice of colour from Vendor’s standard samples. Upgraded trim with 5 1/4? Colonial style baseboards*** and 3? Colonial style casing*** throughout all finished areas. Tray ceiling or coffered ceiling in master bedroom** to have smooth painted finish ceilings on the raised part of the ceiling. All closets to have white vinyl coated wire shelving. Gas fireplace with precast plaster mantle surround (no hearth). ** Purchaser(s) choice from Vendor’s standard samples. Privacy locks on master bedroom and all bathroom doors. Upgraded kitchen & servery cabinetry to have a wide range of door styles and colours available for Purchaser(s) to choose from Vendor’s standard samples. Kitchen base cabinetry to include one (1) set of bank of drawers, one (1) 2-drawer pot & pan cooktop cabinet and colour-matched kick plate. ** Purchaser’s choice from Vendor’s standard samples. All kitchen cabinet drawers to include ‘soft close’ hardware. Granite counter tops in kitchen and servery to have standard profile edge and clean cut back. ** Purchaser’s choice of granite and profile edges from Vendor’s standard samples. Kitchen cabinets to have provisions for a built-in microwave and oven tower, including electrical rough-in. Double stainless steel undermount sink with upgraded single lever pullout spray faucet in kitchen. Rough-in electrical and plumbing for future dishwasher, with open space in cabinetry. White vinyl coated wire shelving for the kitchen walk-in pantry. ** Maximum three (3) shelves. Split electrical outlets provided above the kitchen countertops. Dropped ceiling boxes over kitchen cabinets as required, at Vendor’s discretion. Cabinetry for all bathrooms to have a wide range of door styles and colours available for Purchaser(s) to select from Vendor’s standard samples. Master ensuite and formal powder room to have upgraded elongated one-piece, energy efficient water saver toilet. Master ensuite and formal powder room to have upgraded washerless two handle water efficient vanity faucet(s) with pop up drains. Master ensuite to have marble countertop with standard profile edge, Purchaser(s) choice from Vendor’s standard samples. All secondary bathrooms to have marble counter tops, Purchaser’s choice from Vendor’s standard sample, with undermount sink(s). Full width vanity mirrors in all bathrooms. Wall mounted lighting fixture(s) with wall box above mirror in all bathrooms. Energy efficient water saver showerhead and toilets. Energy Star® qualified exhaust fan in all bathrooms. All bathroom vanity faucets to have shut off valves. Pressure balance shower faucets in all bathrooms, where applicable. Ceramic soap dish in shower stall and tub enclosure. ** Ceramic paper holder and towel bar supplied only, not installed (white). Ceramic wall tiles in tub enclosure, where applicable for all bathrooms, to height of the dropped ceiling. DensShield® tile backer with built-in moisture barrier in shower stall and tub enclosures. Bathroom fixtures to be white. Purchaser(s) choice of Vendor’s standard Berber with 1/4? chipfoam underpad*** or 40oz. broadloom with 1/2? chipfoam underpad*** in all designated bedrooms. Purchaser(s) choice of colour from Vendor’s standard samples (one colour throughout standard). 12? X 12? granite tile flooring*** in front entry foyer, Purchaser(s) choice of colours from Vendor’s standard samples. 3? X ¾” pre-finished, stained oak strip hardwood flooring*** on main floor (excluding tiled areas), second floor hallways and mid height landings. ** Purchaser’s choice of stained hardwood from Vendor’s standard samples. Vendor’s choice of custom address plate with municipal number at front of home. Upgraded black coach lamp(s) at front door and garage doors. Soffit pot lights – six (6) on front elevation only on a separate switch located at the front door. All pot lights to have compact fluorescent bulbs, as per Vendor’s samples. Locations to be selected by Purchaser(s) and approved by Vendor. Two (2) exterior water taps with inside shut-off valves. One (1) located in garage and one (1) located at the back of the house, location at Vendor’s discretion. Lot to be fully sodded except paved and landscaped areas. Coach House style steel painted sectional roll-up garage doors equipped with decorative hardware, heavy-duty springs, decorative inserts and rust resistant door hardware, as per elevation. Paved asphalt driveway installed in two lifts. Final lift installed one winter later. Subsurface disposal will be achieved by either in-ground or raised filter bed or conventional trench systems. Pre-treatment system to consist of a suitable Biofilter sewage treatment system (Vendor’s choice). This system will include a pump tank, if required, as per engineered design. All pump tanks, if required, will be equipped with high-level alarm. A maintenance agreement between the homeowner and the manufacturer is required. Where “deck” conditions or “lookout basement” conditions exist, the location of windows and stairs may vary, as per Vendor’s Architect’s recommendations. All selections, including upgrades, are to be made from Vendor’s samples. Geranium Homes has been registered with Tarion Warranty Corporation since 1985 and is in good standing. A completely computerized customer service program is available for a period of one year after closing. The following three inspection forms are to be submitted to the Vendor’s Head Office: A pre-delivery inspection form to be completed with the Vendor prior to closing. A second inspection form submitted a maximum of 30 days following the closing date. A final year end inspection form submitted anytime between a maximum of 30 days prior to and up to the one year anniversary of the closing date. Tarion coverage: One (1) year warranty on defects in workmanship and materials. Two (2) year warranty on electrical, plumbing and heating delivery and distribution system, water penetration through building envelope and foundation. Seven (7) year warranty on major structural defects. Purchaser agrees to pay Tarion enrolment fee on closing date. 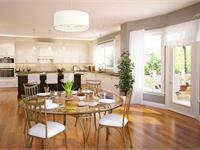 Qualified Energy Star® homes comply with Energy Star® for New Homes Technical Specifications. Inspection, evaluation and qualifications conducted by 3rd party Evaluator certified by EnerQuality®. Hardwood floors: The normal installation practice, as recommended by the hardwood manufacturer, is to install the hardwood perpendicular to the floor joists. Since the floor joists do not typically run in the same direction throughout the floors, the Purchaser(s) acknowledge and accept that the hardwood will not all run in the same direction. Lighting: Purchaser(s) acknowledge and accept that due to framing members (lumber), plumbing pipes and HVAC systems, the ceiling and wall electrical rough-ins and/or light fixtures and/or smoke and CO detectors may interfere with the ‘centering’ or positioning of the above noted items in the applicable space. Your inquiry will be delivered to the developer / builder of Copperstone Ballantrae, who will send you more information about this development.